It is designed to build vocabulary, reading, discussion, presentation, and critical thinking skills. It is supplemented by a comprehensive range of dedicated digital components, which offer great flexibility and help to speed language acquisition. 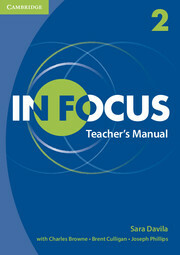 The Level 2 Teacher's Manual contains full step-by-step teaching notes, unit-by-unit summaries, language notes, tips, expansion activities, options for assessment, and a complete answer key.